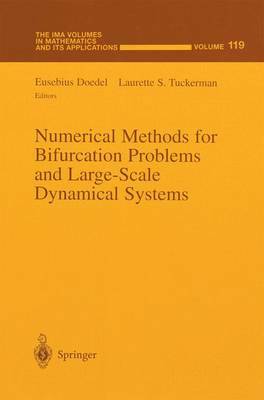 This IMA Volume in Mathematics and its Applications NUMERICAL METHODS FOR BIFURCATION PROBLEMS AND LARGE-SCALE DYNAMICAL SYSTEMS is based on the combined proceedings of two workshops devoted to compu- tational issues. The workshops were an integral part of the 1997-98 IMA program on "EMERGING APPLICATIONS OF DYNAMICAL SYSTEMS." I would like to thank Donald G. Aronson, University of Minnesota (Mathematics); Wolf-Juergen Beyn, Universitaet Bielefeld (Fakultaet fuer Mathematik); Eusebius Doedel, California Institute of Technology (Applied Mathematics); Bernold Fiedler, Free University of Berlin (Mathematics); H.B. Keller, Caltech (Applied Mathematics); Yannis Kevrekidis, Princeton University (Chemical Enginering); Jens Lorenz, University of New Mex- ico (Mathematics and Statistics); Edriss S. Titi, University of California (Mathematics); Laurette S. Tuckerman, Laboratoire d'Informatique pour la Mecanique et les Sciences de l'Ingenieur (LIMSI) for their excellent work as organizers of the meeting. Special appreciation to Eusebius Doedel and Laurette S. Tuckerman for serving as editors of the proceedings. I also take this opportunity to thank the National Science Foundation (NSF), and the National Security Agency (NSA), whose financial support made the workshop possible.